Marziniak M, Ghorab K, Kozubski W, Pfleger C, Sousa L, Vernon K, Zaffaroni M, Meuth SG.Variations in multiple sclerosis practice within Europe – Is it time for a new treatment guideline?Mult Scler Relat Disord. 2016 Jul;8:35-44. doi: 10.1016/j.msard.2016.04.004. In the past 5 years, the combination of developments in diagnostic strategy and approval of new disease-modifying therapies has provided an opportunity to achieve dramatic improvements in patient outcomes in multiple sclerosis (MS). However, across Europe there are several factors that may prevent patients from receiving the best therapy at the appropriate time, and there is variation among countries in terms of which of these factors are most relevant. Here, we review current MS clinical practices in a number of countries in the European Union to identify differences regarding initiation of treatment in patients with clinically isolated syndrome or relapsing-remitting MS, and differences in the timing of treatment switch or escalation. While recognizing that policy is not static in any country, we believe that patients’ interests would be better served if a European treatment guideline was developed. Such a guideline could both inform and be informed by national policies, facilitating the dissemination of best clinical practice internationally. There are variations in how people prescribe and deal with MS and this leads to a post code lottery or a country lottery with different access to treatments depending on where one lives. There is data showing that across Europe there is wide variation in prescribing disease-modifying therapies (DMTs). They make the point that there are numerous factors at play and as a consequence of this disparity, people with MS (pwMS) may not be receiving the appropriate therapy at the correct time. They conclude by making a call for the development of a European treatment guideline that could be used to inform, and be informed by, national policies, to help disseminate best clinical practice.The UK is normally towards the bottom of the pile when it comes to use of DMT. The variability relates to the proportion of people with MS receiving DMT and the proportion of pwMS who are on a second-line DMT. The differing availability in Europe runs counter to the EU doctrine which is to create a ‘single economic area’ covered by just one regulator, the European Medicines Agency (EMA). 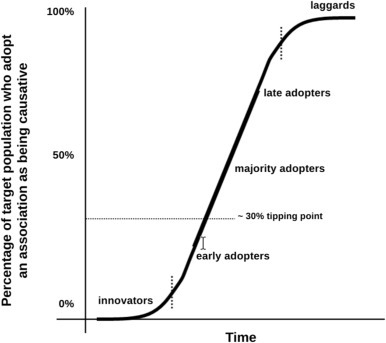 This wide variation in adoption of new innovations is not surprising and influenced by many factors, in particular the ‘diffusion curve’. When successive waves of innovation overlap with each other different acceptance rates exaggerate the variance between countries. The S-shaped diffusion curve is used to explain the acceptance of advances in society. It is characterized by innovators, who generate new ideas, which are taken up initially by a small group of peers called early adopters. This group is followed by late adopters and finally the laggards who bring up the rear. Once approximately 30% of the target audience accepts a new idea, the so called ‘tipping point’ is reached, followed by rapid uptake of the innovation. It is clear that in some countries the penetration of DMTs, in particular the more effective second-line therapies, has yet to reach this tipping point. An unmet need is the timely and appropriate implementation of DMTs within, or at least parts, of the EU. Until this occurs the quality of MS care will vary across Europe to the detriment of patients. Will the development of European guidelines sort out this problem? I suspect not, unless they have widespread support of all the major MS stakeholders, including the payers, or governments. At present much depends on where you are lucky to live rather than what you deserve.